Funeral services for Elvira Pearl Emry Rice, 92, Tonganoxie, will be at 1 p.m. Thursday at Warren-McElwain Mortuary in Lawrence. Burial will follow at Hubble Hill Cemetery in Tonganoxie. Mrs. Rice died Sunday, Sept. 11, 2011, at Lawrence Memorial Hospital. 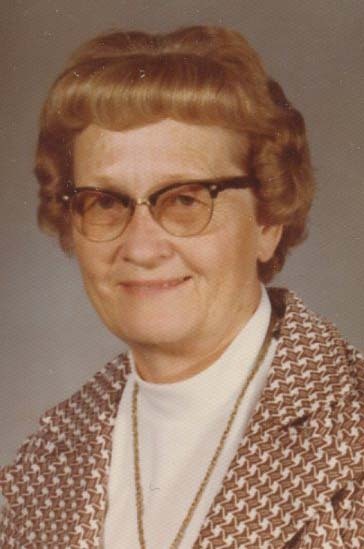 She was born Nov. 25, 1918, in Independence, Kan., the daughter of William David and Catherine Hart Emry. She was a graduate of Independence High School and Independence Community College. She received her bachelor’s degree in teaching from Pittsburg State University. Mrs. Rice began her teaching career in 1939 in a one-room schoolhouse, instructing children in grades one through eight. She taught at many locations around the state of Kansas, including Elk City, Morgantown and various schools in Montgomery County. She retired from teaching in 1981 after nearly 20 years of teaching fourth grade for the Tonganoxie and Jarbalo school districts. She married Frank H. Rice on May 20, 1945, in Coffeyville. He preceded her in death in 2006. Survivors include her twin sons, Bill and Bob Rice, Tonganoxie; three grandchildren; and two great-grandchildren. The family will receive friends from 6 p.m. to 7:30 p.m. Wednesday at the mortuary. The family suggests memorials to the Student Scholarship Fund at Tonganoxie High School, sent in care of the mortuary, 120 W. 13th St., Lawrence, KS 66044.